Today's blog post brings several pictures of Christian which were taken over the past two months. 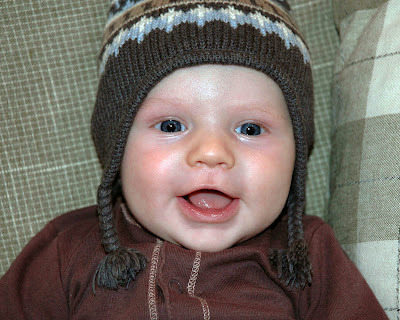 This first one is from just before Christmas and shows Christian ready for the winter weather. This one was taken at Grandma and Grandpa Furr's house during Christmas break. 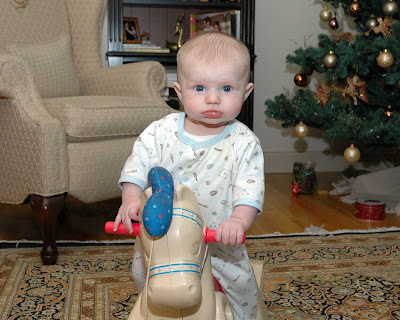 Christian thought he was pretty tough riding this rocking horse, which he surprisingly could remain balanced on for about 30 seconds at a time. Krista took this picture about a month ago when Christian had just woken up from a good night's sleep. He seems very calm and collected. Here's Christian sporting his signature faux-hawk. 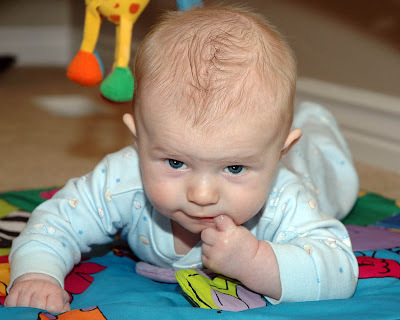 Christian is starting to enjoy tummy time a bit more (he's enjoying gnawing on his finger as well). 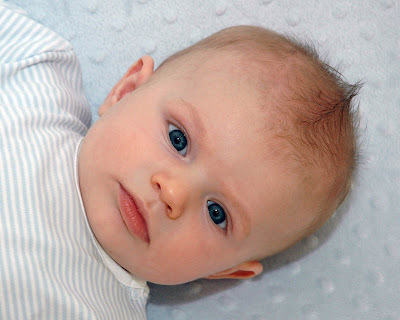 He can now roll over from back to tummy and back again. 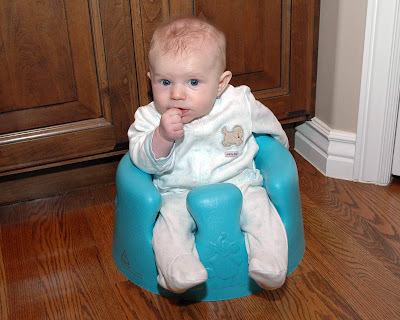 Here's mini-Christian sitting in his Bumbo chair, which makes him look like he has no torso and really short legs. He's sure growing up fast! He is adorable!! He's getting so big and is awfully handsome!! 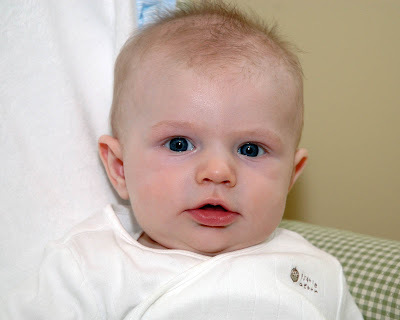 That bumbo picture is pretty cute...and he does look like he has no torso!! CUTE kid guys!! What a cute, happy little guy. I can't believe how big he is getting. Krista, you'll have to give me some ideas for Abby's hair. I think the mohawk looks much better on Christian than Abby. I love how those Bumbo seats make them look like little munchkins! He is getting so big! !